One of my biggest weaknesses as a runner is cross training and I feel like most of my runner colleagues can relate. We use it as a last resort once we’re injured or a once-in-a-blue moon alternative to running after hard races. As painful as it is to get out of our running comfort zone, cross training can help you become less injury prone, increase your training volume without adding additional stress, and strengthen complementing muscle groups we don’t pay enough attention too. All in all, cross training could be the difference in your training plan that could get you to your next breakthrough performance. I realize it’s easier said than done. I for one often feel like a fish out of water entering a gym. What equipment to use? What intensity? How can I get the most bang for my buck literally and figuratively time-wise and exertion-wise. If you got a chance to read my blog on winter training, you’ll remember I laid out some tips on picking a gym. One of the big deciding factors for me was that the gym I joined had to have a pool. That’s because I think, hands down, swimming is the best cross training option for runners because of the quality and diversity of workouts you can accomplish without impact. I am by no means an expert at swimming so when I do get in a pool I tag along with my training partner who has a background in competitive swimming. She basically swims circles around me but at least I get inspired and learn new techniques every time we’re in the pool. Taylor Duncan was a NCAA D1 distance runner for Auburn where she put up some impressive times and attributes a lot of her success to the aerobic development her background in swimming gave her. She kindly offered to contribute her expert advice and a few workouts for you to try next time you jump in a pool. Before I discovered my love for running, I was fully committed to the world of swimming. As I began running, I wanted to keep swimming as a part of my life but with the nature of college running, it was hard to keep it up on a regular basis due to the high level of intense training my body was already undergoing. I typically would reserve getting in the pool to off seasons or during the times I was injured. I’ve since graduated and begun my professional career and have more freedom with my training schedule. I’ve enjoyed reintroducing more swimming (1-2 times a week) back into life and have noticed more than ever how beneficial it is for injury prevention. Swimming is my go-to for active recovery days and when I am feeling stiff and achy. It’s the perfect workout for those seeking something that is low impact but still is a quality workout. Any research on swimming will tell you that it’s a low impact activity, but what does that mean to me as a runner? It means I get to rest all those aching tendons and joints that are working against gravity and absorbing thousands of pounds of impact every time I run. I’ve battled IT Band Syndrome (a common overuse injury) many times in my running career and swimming has always been my first step to recovery. For one, it relieves my injury anxiety because taking an “off” day with swimming is not a wasted training day. And two, swimming is a great way to “stretch out”. I always feel looser after a swim, especially in my hips, lower back, and legs. This is mainly due to the fact swimming increases flexibility and mobility- two things runners, myself included, grossly neglect. 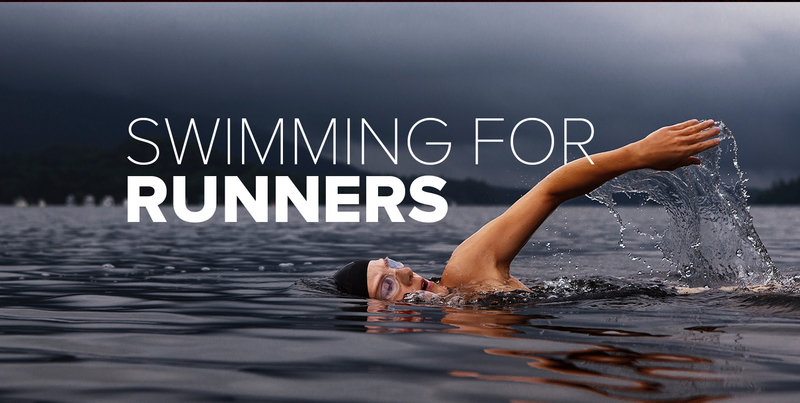 Along with the benefit of being low impact, swimming is great for runners because it strengthens the entire body. And when I say the entire body, I mean from the inside out. Most people associate swimming with strengthening the arms and legs. But there are other parts of the body that swimming strengthens that not all athletes realize, including the hips, core, and lungs. Swimming strengthens the little muscles in the hips and lower back that we don’t always think about, but are so important to us as runners. We tend to weaken our glutes and shorten our hip flexors when we sit all day and then recruit the wrong muscles in a disproportionate fashion when we try to run fast. I specifically want to touch on how swimming strengths the hip flexor and gluteus medius. To strengthen these two areas of the hip follow some of these workouts below. 10X25 yards (1 length of pool) building each 25 yards to an all-out effort with 10-15 seconds count rest. Be sure to focus on quick little kicks. * As you progress and get stronger you can change it up from building 25s to full all-out effort 25yd kicks. * Once that is easy flip onto your back in a streamline position (arms above head, hands together) and do the 10x 25 yards. Build again—focus on keeping your hips up at the top of the water and using small quick flutter kicks. Knees and feet should not come fully out of water. This will also require you to engage your core as you try to keep your hips at the top of water. *After you have conquered the 25s or if they’re too easy to begin with move on to 50s→75s→100s.. lower the number of reps to your discretion once you get to 75s. **Note the gluteus medius is a very important muscle for injury prevention. ** You will do the same workout as previous but with the breaststroke kick. ** This will also help with your hip mobility. ** When you move to kicking on your back for breaststroke focus on keeping your knees underwater. *NOTE: Make sure to engage the glutes the entire time you’re swimming. It keeps your hips from sinking and this helps keep an easier and even stroke… and who doesn’t like to work that booty?? • 10×50 yard Kicks: Alternate 25 yards Freestyle kick and 25 yards Fly kick with 10-15 sec count recovery. • 10×25 yard Fly Kick on Back—make sure to keep a tight streamline with your arms, squeezing your ears…it will help keep you from sinking. Sprints: Swimming all-out 25 yards requires you to engage your core as you swim as fast as you can. *Again I suggest you “build” into sprints. • 8×25 yard Underwater water kicks @ 10-15 count rest; Just as it sounds, I kick in streamline all the way underwater, no breaths. I make sure to squeeze my ears and keep a tight core—my go to kick is fly kick but I have seen a lot of people prefer flutter kick. ***NOTE – Beginners gage your body and do not push yourself too much when you first attempt these. If you have to take a breath come up and keep count of how many you take. Try and take the breaths down as the 25s get easier. • 4-6×75 yards with restricted breathing @ 10-15 second count rest: This gets a little technical, for each 75 yard rep you’ll be breaking it down into 3 25 yard segments – First 25 yards breath every 3 strokes, Second 25 yards breath ever 5 strokes, Third 25 yards breath ever 7 strokes. **When it starts to get easy turn it into 100s and try to take 0-1 breath on the last 25. • 10×50 yards alternating 25 yards underwater and 25 kicking on you back @ 10-15 count rest. I really like this one because you don’t stop after the first 25 and get a nice “lactic” burn as you recover on the second 25. 250 Swim Choice – I usually do some drills for form here.